Welcome to the Akai professional Mpd218 review, the Mpd 218 is the smallest of Akai’s new Mpd2 range but good things come in small packages. Don’t let the name fool you though, this is not an update of the previous Akai Mpd18, the Mpd 218 is a completely new piece of gear that can’t even be compared to Akai’s previous 18 pad midi controller that lacked responsive, playable pads, knobs and workflow. You really are getting massive bang for your buck when you buy this 16 high-quality, velocity sensitive pads,6 rotary encoders, 6 navigational buttons midi controller that is also shipped with Ableton live lite (a great DAW for new music producers and veterans), Akai Mpc Essentials, Sonivox Big Bang Cinema Percussions and Sonivox Big Bang Universal Drums software. If you reading this review of the Akai Mpd 218, then the chances are you’re looking for Pads to either finger drum or tap out beats like the masters of yesteryear such as Pete Rock, J Dilla, Prince Paul And Dj Shadow did with the famous drum machines of the Akai MPC range. If that’s the case then you’re in luck, the Akai Mpd series have put the soul back into these pads at a price that even the brokest beatmakers and producers can afford. Akai themselves have coined these velocity sensitive, rubberized, responsive and grippy pads as FAT, there words not ours but beatmakers and producers across the globe are inclined to agree that these are some of the best pads on the markets at possibly the lost price point. The 218 comes laid out like a traditional pad drum machine, and that’s great, because you know the old saying if it ain’t broke then don’t fix it. Akai have expanded on the capabilities of this machine by adding 3 banks to the 16 pads, allowing the user to quickly and easily switch between drum kits when doing live finger drumming performances, or test, play and add new sounds to your tracks from the loaded drum racks or instruments in any of your 3 banks, stopping producers for referring to the screen and mouse when in deep concentration. Ok, so we now know that the pads are extremely dope and what you need for creating patterns, beats and textures that have depth and movement, thanks to the touch sensitive response of the pads, plus some skills and practice on your part, but what else makes this a great piece of kit. If you’re familiar with using an Mpc or even the Ni Maschine hardware then you will know that these few features that the team at Akai have include on the surface of the 218 are some of the major keys to success when creating beats on a pad based system. Swing, Note Repeat and Full Level have all been added to the bottom left hand side of the real estate, which make for easy flow and repetitive use with the left hand to arm these functions and control short cuts and keep playing with the right hand. The 218 works on both PC and Mac with all the major Digital Audio Workstations in the industry at this point of time. The Midi over USB technology is complete plug and play solution, so no more pesky driver to instal and upgrade, simply, just plug and play to start controlling drums, effects and instruments from your computer. Gone are the days of dragging around an Mpc1000 in a carry case to craft out beats outside of the studio. And really even with the Mpc 1000’s portable size compared to its bigger brothers it’s still a massive hassle to carry around, find and look like a bit of a weirdo at starbucks smashing out hits on the cash register like drum machine. Alternatively the Mpd 218 pads are solid, lightweight and the complete system easily fits onto your backpack alongside your laptop for producing on the road and session outside the studio. 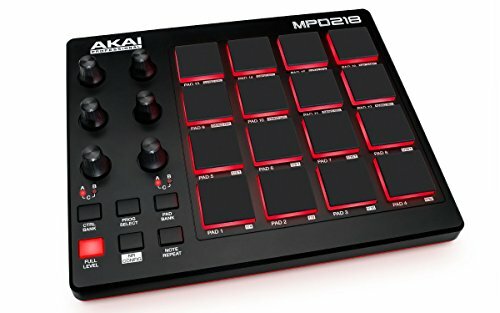 At the time of this review the Akai Mpd 218 is being sold on Amazon for under 100 bucks, which really is a bargain for capabilities of this midi controller and what is allows you to create as a producers, not to mention the ultra portable and quality build and stacks of free software that comes included with this bundle. If you’re a beat creator looking for a portable and playable version of the MPC then go for the Akai 218 for the price and what’s included your really can’t go wrong with this super set of portable pads. Also is your new to music production and you’re looking for your first pad midi controller to knock out beat on fruity loops, Ableton live, reason, garageband or any of the other software on the market then pick the 218 up as your first drum pads, and get quality without putting too much cash into your studio equipment. Check out the rest of the Akai Mpd2 range is you’re looking for a less portable and more hands on midi controller that offers the same high quality pads, packed with faders, knobs, sequencers and LCD screens to give you more overall control of your music production. Producers who have chosen Ableton Live as their weapon of choice love the power and workflow of the Launchpad pro and Ableton own, Ableton Push 2. Check out our in depth reviews of these products if love launching clips and warping sounds with the flex and muscle of Ableton live.